The jailbreaking community is going to be experiencing a lot of great things in the next couple of days to come as Pod2g and his team is ready to release; their iOS 5.1.1 untethered jailbreak. This jailbreak is for all the devices that are running on the latest firmware, except for third-generation Apple TV. The people who are responsible for the production of the jailbreak were all present together at the Hack in the Box security conference (HITBSecConf) held in Amsterdam. 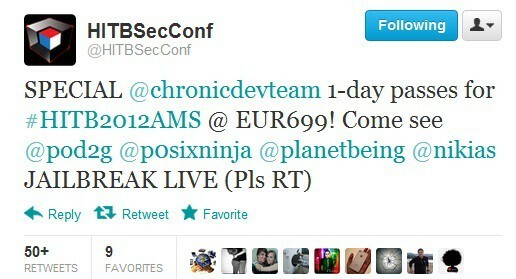 Many people were excited when the official Hack in the Box Twitter account announced that the 1-day passes for the event will be made available tomorrow when, in order to demonstrate their jailbreak to the audience, the Chronic Dev Team will come on stage. This seems to confirm the rumors that have been going around about the prominent Chronic Dev Team members ready to show the Absinthe 2.0 to the masses at the conference. For those of you who will be attending the event, be ready to be impressed by the abilities of the second-generation Absinthe tool, when they are demonstrated by Pod2g, P0sixninja, Nikias and Planetbeing as well as by the team server admin iOPK. The leader of the iPhone Dev Team, MuscleNerd will also be attending the conference and will be presenting the evolution of the iPhone basebands. There isn’t a lot we know about what will happen at the conference. All we know is that we can expect a full demonstration of the Absinthe 2.0 on the latest iPad along with an explanation and insight into the exploits that have been used in order to produce it. If you are interested in attending this conference yourself, then you should get the special one-day passes which the Hack in the Box Security Conference is offering. Will you go and attend? Previous articleFinally Mark Zuckerberg Married Priscilla Chan — Congrats!